After weeks of “The Voice” Blind Auditions, Battle Rounds, finally Knockouts, the coaches have completed their teams of artists consisting of five members each to give us the Top 20 who will be competing against each other during the Live Playoffs rounds starting next week. “The Voice” Coaches have their own strategies for the live shows. Gwen Stefani says her team is going to crush it. Blake Shelton said he’s got veterans and new singers. They all say their team are ready for the playoffs. Below is a recap of each of the coaches teams as they put them together, and our predictions of who will be their biggest threat based on their talent factor, and ability to sneak-in past the competition to over-take them. Pharrell said he’s trying to help everyone on his team get to greatness. Adam said Pharrell has one of the best teams. Elyjuh Rene is an 18-year-old who turned to music after his father left. Pharrell advised him to sing his own story after he won the the Knockouts. Pharrell said DaNica Shirey just lured him in during the Battle Rounds. Gwen said she was so jealous that Pharrell had DaNica. Pharrell said DaNica could win. 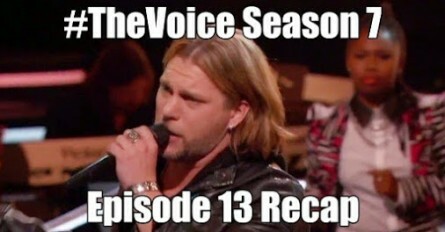 Luke Wade was the first Blind Audition this season. Pharrell said Luke is a force to be reckoned with. He won Luke over when bragging about producing Robin Thicke and Justin Bieber albums. Jean Kelley first chose Gwen in the Blinds, but was stolen by Pharrell during the Battle Rounds after beating out Adam who also tried to steal her. Pharrell said she can win if she opens her heart. Sugar Joans began on Team Gwen, then moved to Team Pharrell when he stole her during the Knockout Rounds. Pharrell told her “come home.” Pharrell said his team is “pretty collectit” and they’re a soulful bunch with five interesting stories. Gwen’s team is full of pop, soul and reggae. Gwen said she thinks she won The Voice. Pharrell said her team is full on “sneak-attacks” that you can’t take lightly. Her first member is Taylor John Williams. Gwen was impressed by his artistic ability. She won him over during the Battles when she told him he can inspire her. Gwen called him a “peer” during his Knockout Round. Anita Antoinette returned to The Voice after not being selected in season 4. Gwen said she would have picked her in season 4. Gwen said Anita has so much personality and stage presence. Ryan Sill has an A Capella past and left a career of engineering. Gwen was surprised by his high notes. He won in the Knockouts for his evolution and ability to grow. Bryana Salaz turned 3 chairs during her Blind Audition and picked Gwen. She learned restraint in her voice from adviser Taylor Swift during the Knockouts. Gwen said Bryana has a strong voice with a lot of range. Ricky Manning started on Team Pharrell and continued on from the Battles. He came in like a wrecking ball during the Knockouts, but lost to Elyjuh Rene. That’s when Gwen stole him and said she thinks that she just won The Voice because his performance was “amazing.” She said music is just emotion, and he’s perfect. Gwen said she has so many singers with potential and believes that the winner is on her team. Taylor Brashears has a vintage sound that got Blake’s attention in her Blind Audition. Blake said his favorite thing about Taylor is the conviction that she sings with and she has amazing control. Blake said she means every word when she’s on the stage. James David Carter had a four chair turn during his Blind Audition. Adam and Gwen stood on top of the backs of their chairs for James. Blake called it the best country audition that he’s ever heard. He won the Knockouts against Craig Wayne Boyd. Blake said the other artists on his team are going to step-up against James. Craig Wayne Boyd got Blake and Pharrell to turn. Gwen stole Craig during the Battle Rounds, and finally did the fashion make-over to him that she wanted to during the Knockouts. She said she made him over to look like a guy that she’d want to make-out with (hmm…Gavin Rossdale)! Blake stole Craig back when Gwen decided to keep Anita. Blake said he knew when he selected James over Craig during the Battles that he was letting an amazing artist go. Reagan James got chair turns from Blake and Gwen. Blake said they’ve never heard anyone like her on the show. Pharrell said he thinks she’s a threat after she also won the Knockouts. Blake called her the most important artist he will have a chance to work with. Jessie Pitts started on Team Gwen. Blake called her voice like a bowl of Lucky Charms (marshmallows only). Blake used his last steal to get Jessie during the Battle Rounds. Blake described his team as now Country, back-then Country, southern-rock Country, and R&B. Adam said his team is looking good and he’s very happy. TSA agent Damien was the first one on Team Adam. He got a four chair turn. Adam said Damien is so emotionally connected to music that it’s beautiful. Pharrell said if Damien continues to stay on the path of that sound and era, he’ll be a threat to his team. Chris Jamison is a college mail man who impressed three coaches to turn in the Battle Rounds. His soulful performance during the Knockouts earned him a place to remain on Team Adam. Adam said Chris is limitless. Matt McAndrew wowed Adam from the beginning and adviser Stevie Nicks said he has the ability to make his audience cry. Adam said there’s something about Matt “that’s really spectacular”. Pharrell called him a star. In the Knockouts, Adam said Matt is constantly showing him that he can evolve and grow and do anything. Mia Pfirrman is a college student and is from parents who are also music artists. Adam called her world-class spectacular during the Blinds. Adam said with her raw power, she’s on the cusp of being professional. 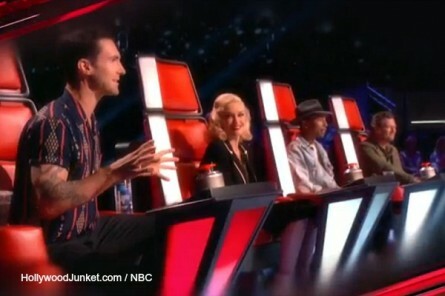 During the Knockouts, Adam called Mia so perfect and rare. Taylor Phelan is a family man who started on Team Pharrell, and got stolen by Adam in the Knockouts. Adam said Taylor made his team ten times stronger. Adam’s team is full of four-chair turns, and Blake said his team is looking stronger and stronger and “that’s intimidating”.